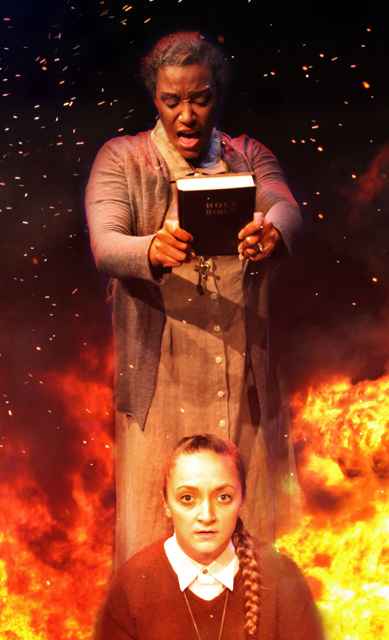 (Top to Bottom) Brooke Aston as Margaret White and Madeline Ellingson as Carrie White Photo by Alvin Chiu. In what is possibly the most logical decision a theatre department made this month, Cal State Fullerton has elected to put on Carrie the Musical. With Halloween just around the corner it’s nice to have a spooky show to watch, and it’s even nicer to see a musical with some gore to shepherd in the holiday. Stephen King’s 1974 novel Carrie has served as the inspiration for three films (and a horrible sequel), and the picture of a girl drenched in blood is so iconic most people recall the image if not the actual story it originates from. After a spectacular failure as a production on Broadway, many people thought Carrie the Musical was over for good until the Off-Broadway revival took a hatchet the original score and script. Now Carrie the Musical is back with a vengeance, and Cal State Fullerton is bringing us their version of the telekinetic teen. Of all the “scary” shows I have seen this is definitely one of the better ones. High school senior Carrie White can’t catch a break. She’s ostracized and mocked at school. Her main source of social interaction comes her fanatically religious mother, so it is no wonder Carrie is shy and withdrawn. She is also ignorant of the ways of the world. For example she has a meltdown during her first menstruation –falsely believing she is bleeding to death. After her peers and mother castigate her, not only is it apparent she is not dying, but she has also gained the super-powered ability to move things with her mind. New possibilities for friendship and belonging appear but so do the possibilities to wreak vengeance on her tormentors. The main set background used is a rusty high school gymnasium, which serves as both a realistic public school setting and a reminder of how unclean the whole show really is. Each scene transition is done skillfully and with attention to detail. They managed to adapt the story for the time period successfully —placing an emphasis on cameras as a both a storytelling medium and a way to torture Carrie. While the use of cameras is not necessary to enjoy the production as a whole, I understand the desire to make a story rooted very firmly in the 1970s into more of a modern-day story. It’s for this reason it works. I have always enjoyed the score from Carrie, and the CSUF cast sings it very well. I would prefer for Carrie herself (played by Madeline Ellinson) to hold the notes a bit longer to enhance the drama and power of the title song, but otherwise she does well. Carrie’s mother (Brooke Aston) is both affectionate and domineering as the ultra religious Margaret White. This mother-daughter relationship is significantly more love-based than the one in the book or any of the three movies. Having said that, Margaret is still a very troubled person, and Aston’s deep and somewhat soothing vocals strike an eery contrast with the frightening words she sings. Special mention of the night goes to Katie Lee as vindictive bully Chris Hargensen. In addition to the fact that I could listen to Lee’s voice all day, her tough-girl persona resonates with us particularly well as a modern-day aggressor. Her confidence makes her appear as one of the most comfortable performers on the stage. Although enjoyable, the show itself is not perfect. Ultra-desirable boyfriend Tommy Ross does not seem to have a strong enough relationship with any of the women he shares the stage with. He and Sue are simply not believable as a couple, and he does not seem strong enough to be a convincing “hero” for Carrie. To be fair, the lines written for both him and Sue are some of the cheesiest in the entire show, but coupled with the constant space between the characters onstage, it leaves the pair looking awkward and somewhat ill at ease with one another. There are some out-of-place moments that take the story on detours, such as when Carrie is informed she really needs to focus on landing herself a man. Having said that, the song in question is “Two Unsuspecting Hearts,” and Elyssa Alexander –playing sympathetic gym teacher Ms. Gardner –sings it beautifully. There is a certain prom scene I feel the need to touch on. Those familiar with the story might be concerned a live version of this scene will be weak or otherwise unimpressive. I am here to assuage your fears. The Prom scene is exciting, and the entire show is enjoyable to watch. Carrie the Musical is an excellent musical theatre experience for the month of October, and I encourage you to go see it. I'm a super scary cat, so I thought the level of scary was good enough for me because I absolutely hate anything scary. I love this play, my roommates and I enjoyed it so much because of the acting and how it's a musical for a college level performance. Loved the singing and the characters. I thought everyone fit their character that they played, and it was a great play towards the Halloween spirit.